Try our automatic nesting algorithms with your parts for free! Thanks to this 100% web-based application for automatic nesting, any user can evaluate the performance of the Powernest nesting engine in a few seconds, using their own parts. Using it is as easy as pie! Data are sent to remote servers for cloud computing. Nesting results are directly displayed on your computer or as a PDF report. Easily evaluate how much material you saved and compare the results with those from competing solutions. Who can use OUR NESTING DEMO APP? 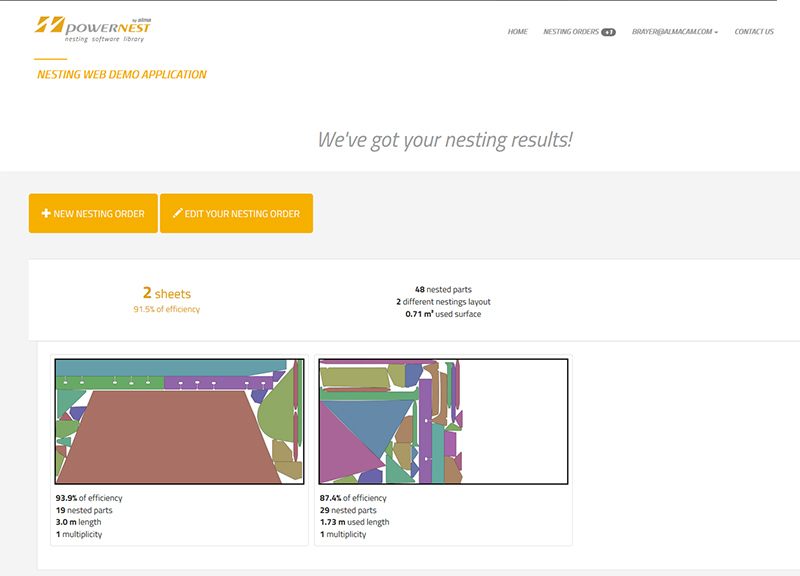 Whether you are a CAD/CAM software developer, a machine-tool manufacturer or a industrial manufacturer equipped with cutting machines, you can try our cloud-based nesting demo app with your parts and check by yourself the performance of our automatic nesting algorithms. You can even send a DXF of a nesting layout you’ve already performed. Our intelligent nesting demonstrator identifies the parts and sheets then performs the nesting all over again, completely automatically!